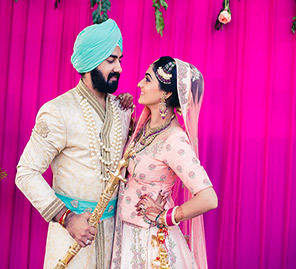 Shivank and Akanksha blended modern and traditional elements with elan as they planned their wedding celebrations flawlessly, which included a grand engagement do and a simpler, elegant temple wedding. Check out some highlights below. 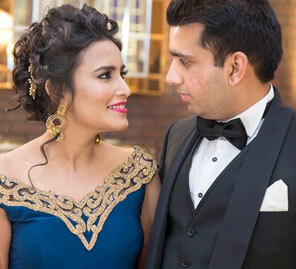 Bride Akanksha and Shivank are both deeply involved in social service and that’s what brought them both together. Shivank had set up his NGO, Karma Foundation for spreading awareness about creating good causes, and Akanksha first met him when she went to volunteer at the NGO. “It’s been three years since we first met, and now it seems like just yesterday! 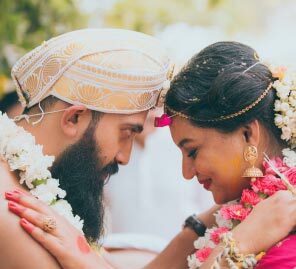 There was no looking back once we clicked, and with each passing day, we grew closer till we decided to cement our bond by tying the knot,” shares Akanksha. 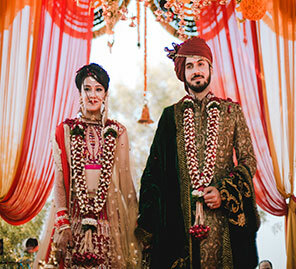 Akanksha and Shivank both wanted a traditional wedding with modern elements, so they chose the Sai Sagar Dham temple in New Delhi as their wedding venue. The bride wore a beautiful voluminous peach and cream gown by Shantanu and Nikhil, which she paired with pretty silver jewellery. The wedding nuptials were a traditional affair with the bride and groom tying the knot in a traditional temple setting. The bride wore a gorgeous lehenga from Frontier Raas with stunning all-over gold intricate design, dual dupattas and short-sleeved blouse which paired well with her elegant neckpiece, earrings and ‘maang tikka' (forehead ornament) by Hazoorilal Jewellers. Shivank looked like a regal prince in his classy outfit by Diwan Sahib.